Most cities dedicate a dismal amount of space to one of humanity’s greatest needs: The need for social contact. Streets are the most abundant form of public space and yet most streets are polluted, dangerous, and unpleasant – and certainly not for social contact. The result is a society of isolated people, people who don’t know each other and don’t care about each other. The task is clear: We must reclaim key streets and make them for everybody; in other words, to pedestrianize them. But nothing is possible without the right leaders. The Piazza Saint Francis – aka Poet’s Plaza – is a vision to create an Italian-style piazza on a block in San Francisco’s North Beach neighborhood. After a 15 year push, the San Francisco Municipal Transportation Agency (SFMTA) board dropped the project at a recent public hearing. Its reasons for doing so get to the root of what leadership is about. Leaders must sometime make unpopular decisions. The quote above negatively slants the idea of unpopular decisions as impositions on the community. But leaders cannot escape the responsibility to do what’s right, even when it’s not the popular choice. And popular opinion is no guarantee that something is right. Often it takes time for the public to come around to an idea. Leaders have more access to information than the public, leaders should have superior vision. Their job is to act on it. Visit central Copenhagen’s Strøget area today and weave through thick crowds. It’s hard to imagine this area being anything other than a wildly popular pedestrian-only district. And yet, until 1962 Strøget was a typical street for cars, traffic-choked and polluted, hardly a great place to go. And so that year, Copenhagen’s leaders stood up and went bold, quickly and quietly converting Strøget into a pedestrian-only street after the annual Christmas street closure. There had been no major public push for this. There was such tension that on opening day police were present to protect leaders from assassination attempts and merchants howled that that business would evaporate. And yet, the leaders stayed their course. It soon became clear the plan was working. Pedestrian traffic rose 35% just in the first year and some merchants were soon claiming the change had been their idea. And so, the pedestrianized area was expanded in 1968, 1973, and 1992, from an initial 15,800 square meters to an eventual 100,000 square meters. On February 26th 2009, New York mayor Michael Bloomberg announced that Times Square would be pedestrianized as a test until at least the end of the year. Bloomberg hadn’t taken a survey of nearby businesses or residents to get a feel for public support; one can imagine the furor if he had. Instead, he acted upon facts, a report showing that 90% of those passing through Times Square were pedestrians, who were being squeezed into 10% of the space. So Bloomberg turned the tables. As soon as the barricades went up, people flooded into the new pedestrian space as if it had always been that way. In fact, the biggest complaints were over the color of the cheap garden chairs purchase at the last minute to fill the area. Naturally, there was backlash against Bloomberg’s bold move, especially over allegations of increased traffic congestion. But the city refused to back down, instead collecting more data, which eventually showed that congestion had not increased after all. Times Square remains pedestrianized today and is more popular than ever. 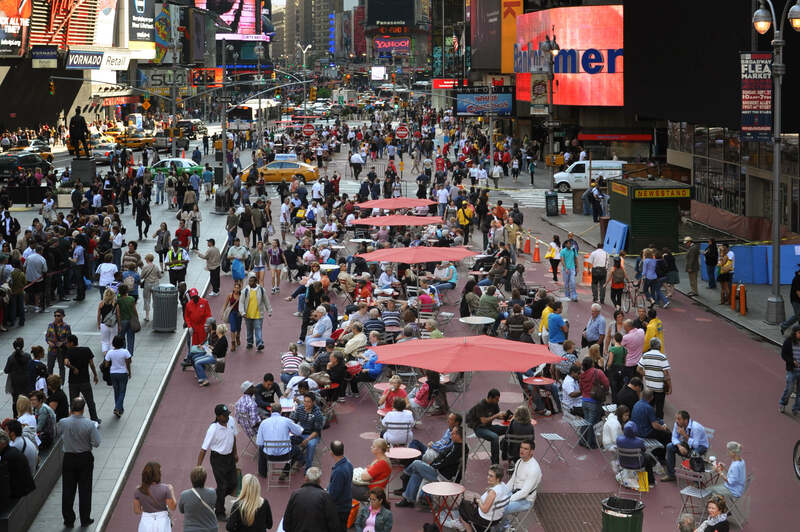 Indeed, New York City is steadily expanding and adding to its car-free spaces. A new pedestrian oasis in Paris. Source. Paris Mayor Anne Hidalgo, pictured at the top of this article, is today’s golden measure of strong leadership in the face of resistance. 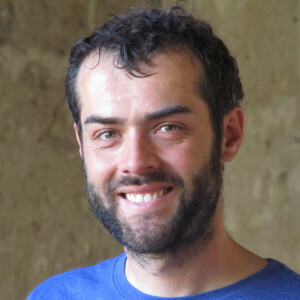 In 2016, after years of temporary Paris Plage “pop-up beaches” events along the River Seine, under Hidalgo’s leadership cars were permanently banned from a large stretch of one side of the river. This wasn’t some minor side street; it was a major east-west arterial. Suburban mayors and pro-car advocates lined up in protest, Hidalgo’s personal phone number was publicized in an attempt to force her to back down. Hidalgo’s response? Keep on going. The car-free stretch of the Seine will be extended, cars will be banned from other streets and intersections, parking spaces are being removed across the city, traffic lanes are being converted to protected bicycle lanes. 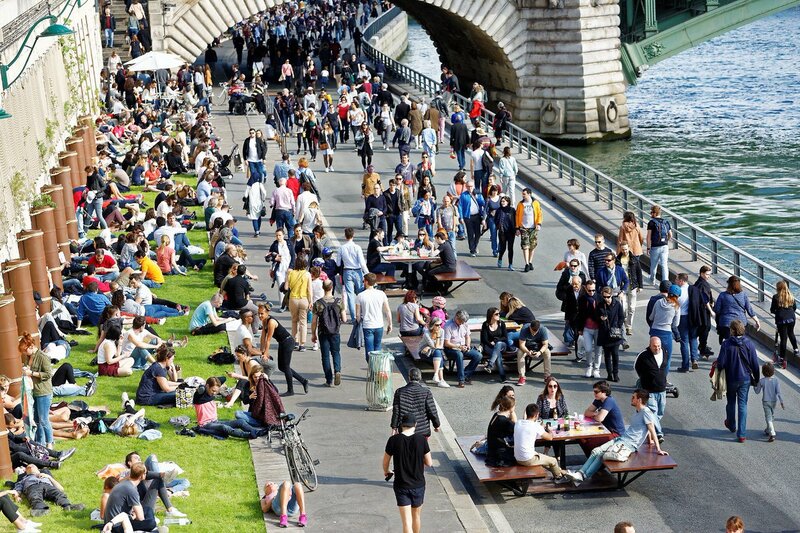 All this has put Paris at the front of a growing movement to tame cities, curb the damage caused by at-all-costs automobile use, and hand public spaces back to the people. The photo above shows how it’s panning out. The leaders of these and many other cities acted in the face of intense opposition. They were bold, they did what was right regardless of initial public sentiment, they acted on facts not fear. And the results were some of the world’s favorite urban places, visited by millions every year. As for the SFMTA board’s decision to back down from Poet’s Plaza – a far smaller project than those in Copenhagen, New York, and Paris – the board should think carefully. San Francisco needs more public spaces. There should be no “if” but “when” when it comes to planning the next public space. Poet’s Plaza should be revived and tested on a temporary basis. But if the board thinks Poet’s Plaza is too politically toxic, then where is the next location that would work as a pedestrian area? We know how San Francisco needs to go about it next time: Be bold; roll it out quickly, using temporary materials; measure results; and act on data, not shouting. And expect backlash. It’ll be ugly. The question is how ugly it’ll get. Furious neighbors storming City Hall, businesses holding rallies, politicians being threatened; accusations that leaders are anti-democratic, paternalistic, and arrogant. Get used to it. Change comes at a price. NextWhy Don’t We Build Beautiful Places Anymore? 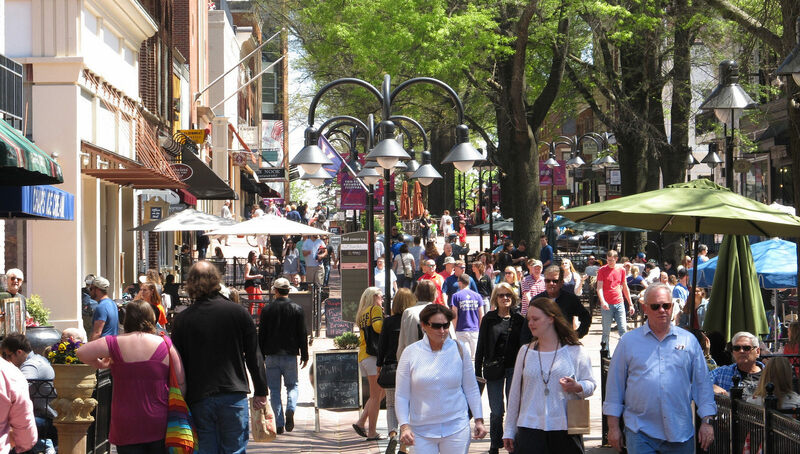 The city in which I live, Portsmouth NH, is planning to pedestrianize it’s downtown as pilot program during weekends in July this year. The plan is facing all of the predictable backlash from people concerned about traffic, loss of parking, and damage to businesses. Do you have statistics that show the degree to which pedestrianization benefits businesses? I’m looking for some hard data I can use as ammunition in the debate. Thanks! Great to hear from a reader in Portsmouth NH, which is easily one of the best towns in the US that I’ve seen. I bicycled through there on a New England bike trip in 2018 and was struck at Portsmouth’s liveliness and beauty. Turning onto Market Square, the thought immediately hit me that parts of downtown might work for pedestrianization for either part or all of the year, so it’s great that the pilot is happening. Because changing the built environment is such an emotional issue for many people, I wouldn’t expect most folks’ minds to be changed by economic impact data. They need to see and experience the change, which is why piloting is the right approach. History is littered with examples, such as with Copenhagen mentioned above, where people initially hated an idea but came around to it when they got to experience it. And of course, pedestrianization has to be done right to be an economic positive; plenty of US pedestrian malls failed in the 20th century because of a poor understanding about the necessary ingredients of public space. With those notes of caution aside, I will dig up and send some studies to you on the economic impacts of pedestrianization. Keep us updated on how things go in Portsmouth!